TeamSupport offers a powerful search tool which allows you to find Tickets, KB’s and Wiki articles quickly. You can also perform advanced filters and sorting to better narrow down your search. Simply type a keyword into the search bar and your results will be displayed below. The results, which are sorted by relevance, include an icon that represents the area where the result was found, which correspond to with the icons located in the main left navigation. You can choose which area to include in the search by checking the boxes to the right of the search. 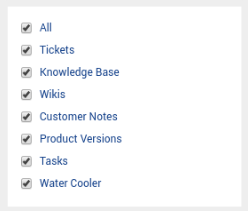 The results include an icon that represents a Ticket, Knowledge Base, Wiki, Customer Notes, Product Versions, Tasks, or Water Cooler. You can click on any result, and it will open in a new tab. Optionally, you can apply a Advanced Filter or Sort to your search. When you add a filter or sort, the results will update automatically. While the above options will help you find 99.9% of what you’re looking for, you can perform even more advanced searching using the commands below. Boolean searches are fully supported as well when more direct search results are required. Boolean searches allow you to combine words and phrases using the words AND, OR, NOT and NEAR (otherwise known as Boolean operators) to limit, widen, or define your search. Noise words, such as “if” and “the”, are ignored in searches. If you use more than one connector (and, or, contains, etc. ), you should use parentheses to indicate precisely what you want to search for. For example, apple and pear or orange could mean (apple and pear) or orange, or it could mean apple and (pear or orange). For best results, always enclose expressions with connectors in parenthesis. *cipl * would match principle, participle, etc. ba%nana: Word must begin with ba and have at most one difference between it and banana. b%%anana: Word must begin with b and have at most two differences between it and banana. # for Phonic searching. Phonic searching looks for a word that sounds like the word you are searching for and begins with the same letter. To search for a word phonically, put a # in front of the word in your search request. ~ for Stemming. Stemming extends a search to cover grammatical variations on a word. To add stemming selectively, add a ~ at the end of words that you want stemmed in a search. & for Synonym searching. Synonym searching finds synonyms of a word that you include in a search request. You can also enable synonym searching selectively by adding the & character after certain words in your request. ~~ will search for a numeric range. A numeric range search is a search for any numbers that fall within a range. To add a numeric range component to a search request, enter the upper and lower bounds of the search separated by ~~.A numeric range search includes the upper and lower bounds. apple w/5 12~~17: This request would find any document containing apple within 5 words of a number between 12 and 17 (upper bound and lower bound). ## for Regular Expression searching. Regular expression searching provides a way to search for advanced combinations of characters. A regular expression included in a search request must be quoted and must begin with ##. When used in searching, a regular expression must match a single whole word. For example, you could not search for “apple pie” with a regular expression “##app.*ie”. 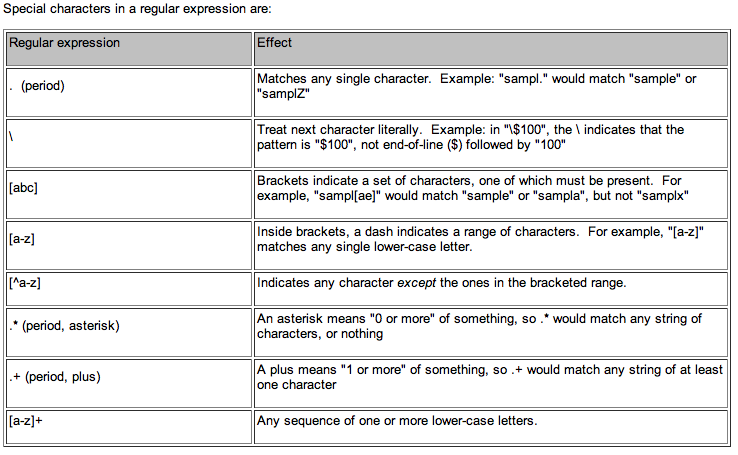 The beginning of line and end of line regular expression markers ^ and $ cannot be used in searches. (1) A regular expression must match a single whole word. For example, a search for “##app. *ie” would not find “apple pie”. (2) Only letters are searchable. Characters that are not indexed as letters are not searchable even using regular expressions, because the index does not contain any information about them. (3) Because our search index does not store information about line breaks, searches that include begining-of-line or end-of-line regular expression criteria (^ and $) will not work. (4) No case or other conversion is done on regular expressions, so a regular expression must match the case of the information stored in the index. If an index is case-insensitive, all letters in the regular expression must be lower-case. If a character is not searchable in the index, then it cannot be included as a searchable character in the regular expression. Non-searchable characters in a regular expression are not ignored as they are in other search expressions. A regular expression is like the * wildcard character in its effect on search speed: the closer to the front of a word the expression is, the more it will slow searching. “appl. *” will be nearly as fast as “apple”, while “. *pple” will be much slower. The = wildcard, which matches a single digit, is faster than regular expressions for matching patterns of numbers. For example, to search for a social security number, you could use “=== ==” instead of the equivalent regular expression.